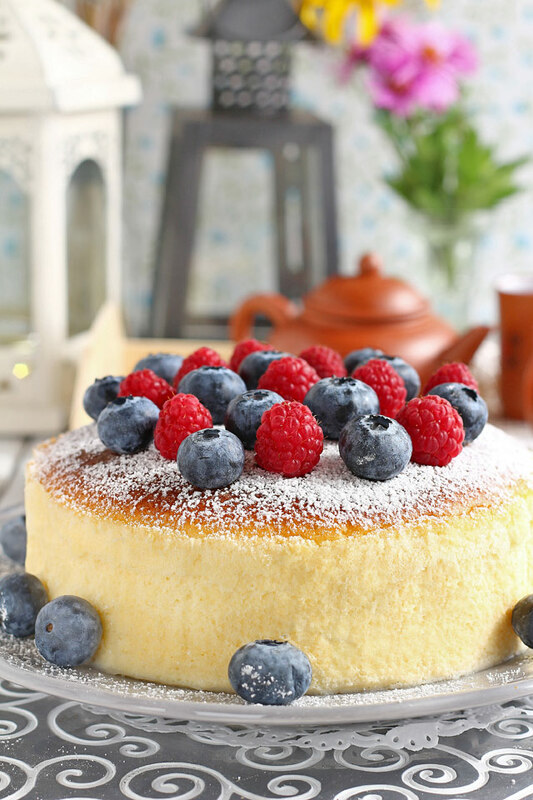 Try this Japanese Cheesecake or Cotton Cheesecake recipe for a super fluffy, light-as-air cheesecake you will ever make. Add some fresh berries to make it pretty and ready for any special occasions. It is fluffy, it is jiggly and it is yummy! 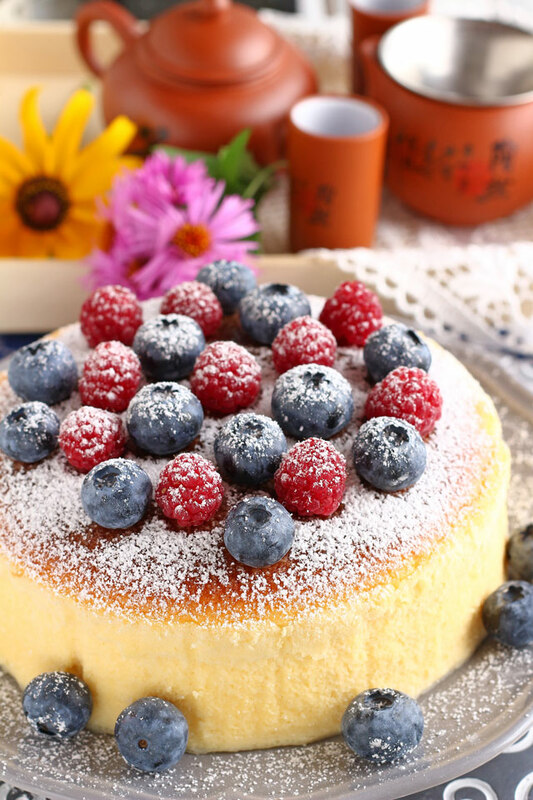 Japanese cheesecake or also known as cotton cake, Japanese souffle cake or pillow cake is a kind of sponge cake where the egg whites are whipped into a meringue and then added to the cream cheese-egg yolk batter to create a fluffy texture. The cake is then baked in bain marie or a hot water bath that makes it moist and jiggly. 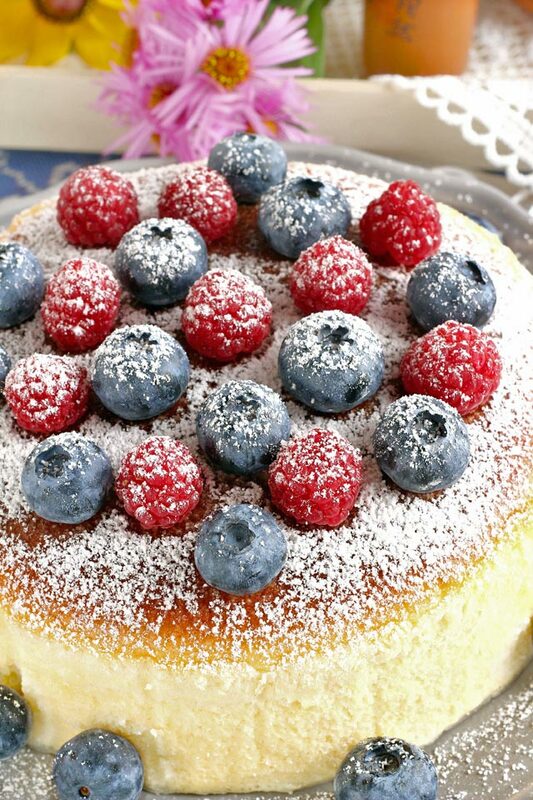 It has fewer calories per serving than a regular cheesecake as it contains less sugar and cheese. 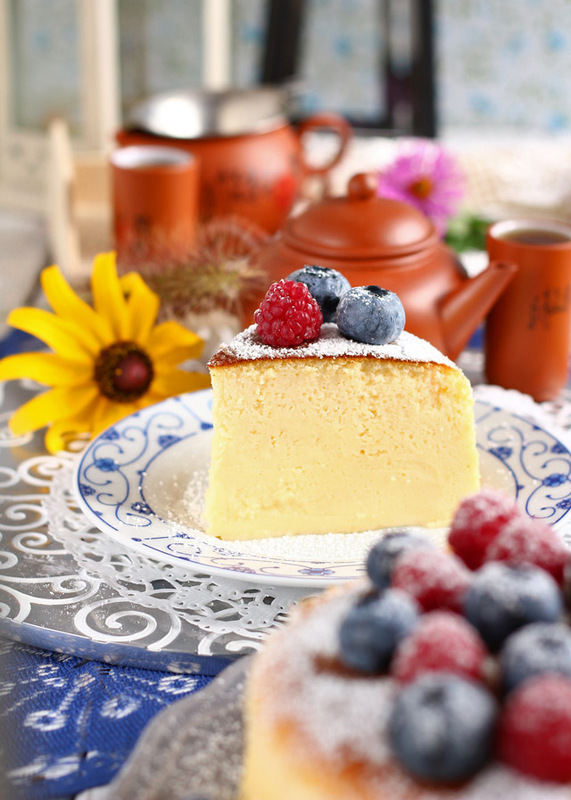 It took me a while to write about this beautiful and heavenly Japanese Cheesecake. The reason for that is, I had to do it three times to get it picture-ready for my blog, but I am not complaining at all, neither is Armin from the looks of it. He was actually the one urging me to make a “better” one and then another. Although the first two Japanese cheesecakes I made were not picture perfect, they were still delicious. It was only that my first one came up nice after baking but once it cooled down it turned wrinkled at the top. The second one was firmer and nice all throughout even after chilling but it had a big crack on one side separating the top brown part from the rest of the cake, which of course looked weird. But after reading a lot of different Japanese Cheesecake recipes and my multiple attempts, (I think) I know now why I failed the first two times. With all the three cakes I made, I only used the same recipe that my most beautiful sis-in-law, ate Mia, gave me (do not worry that I hurt anybody else’s feeling with my superlative comment as she is the only sis-in-law I have). So I knew that it has to be the technique I was using that was causing all the problems. At both times I might have over-beaten my egg whites. This caused the cake to rise too much and with the first cake. The which I baked at 160°C for about 30 minutes then lower the temperature to 140°C because I thought it was already too hot, it made the cake rise then deflate, thus, the wrinkled surface. As for the second cake, which I baked at 200°C for 15 minutes and lowering again to 150°C for another 50 minutes, it did not have wrinkles but cracked instead. So I, therefore, conclude, that over-beating the meringue and baking the Japanese cheesecake at a temperature that is too low or too high and too long will result to a not so good looking but still delectable cakes. For the third cake (this one in the pictures), I beat the egg whites at only medium-high speed (never use high speed) until almost reaching soft peaks and stop there and baked the cheesecake at 200°C for 15 minutes then 150°C for another 15 minutes then turning off the oven and leave it there for another 30 minutes with the oven door closed and another 10 minutes with door open. The result… a perfect dome with no wrinkles nor cracks. With this technique, the cake did rise but not as much as the first two times. Which is good…or bad…depending on how you like it I guess… I like to have the Japanese Cheesecake while it is still slightly warm. But it is equally good when chilled for at least 3 hours or overnight. Try this Japanese Cheesecake or cotton cheesecake recipe for a super fluffy, light-as-air and heavenly cheesecake you will ever make. Line the bottom and sides of an 8 inch round pan or springform with parchment paper. Wrap the pan with 2 sheets of aluminum foil (no need if using aluminum pan) sealing it completely. Fill a larger pan halfway with water. Place it the lowest rack of the oven. Preheat the oven to 150°C. Combine the cream cheese and butter in a big microwave safe bowl. Warm it in the microwave until it melts. Add 1/4 cup sugar and mix well until mixture is smooth. Using a whisk, add the milk and lemon juice and mix. Add the yolks one a time while mixing. Sift the flour and cornstarch while gradually adding them to the mixture and mix until well combined and smooth. Sieve the mixture if needed to get rid of lumps. Beat the egg whites at low speed for 2 minutes, add the cream of tartar if using and increase speed to medium-low and beat until foamy. Gradually add 1/4 cup sugar while beating for another 30 seconds then turn speed to medium-high and beat until almost soft peaks forms. Using the whisk, fold in the meringue into the cream cheese mixture in three parts until well combined. Pour the batter into the lined pan. Tap the pan on the kitchen or tabletop to remove the bubbles. Place the pan into the water bath and bake at 200°C for 15 minutes, lower the temperature to 150°C and bake for another 15 minutes. Turn off the oven and leave the pan in the water bath inside with the door closed for another 30 minutes then another 10 minutes with door open. Hi, Bebs! First time making this recipe & it turned out well. I used low fat cream cheese & still tasted lovely, not too sweet.Husband & kids loved it. Brilliant recipe! That is absolutely great, Dee. I should add that to the recipe notes for those who want to use low-fat cream cheese. Thanks for sharing. I vouch for Kaiser springform pan. No leaks, no seepage. Just Perfect. So this recipe tastes good no matter what happens. My only problem is keeping it raised. It always falls after taking out of the oven (after that last 10 minutes with the door open). I tried one suggestion to leave it with door open for an hour. That fell too. Any thoughts. Hi Kayla, this usually happens when the egg whites are beaten too fast and too much. Try a lower speed than you used. It will take longer but it will give a more stable meringue. Also, try not to overbeat. Stop when you just reached soft peaks. I am sorry to hear that Tracy. The only reasons I can think of is that the egg whites were not beaten correctly to make a stable meringue or it was over mixed when added to the egg yolk batter so it caused the meringue to deflate and prevent it from raising. Is it 200 and 150 C or F?? When you say sugar, what type of sugar are you using? 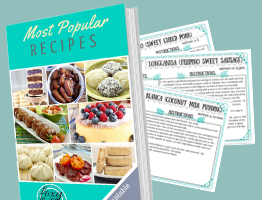 I have seen these recipes call for different types, so I wanted to ask. Hi Morgan, I used regular white granulated sugar. Hello! 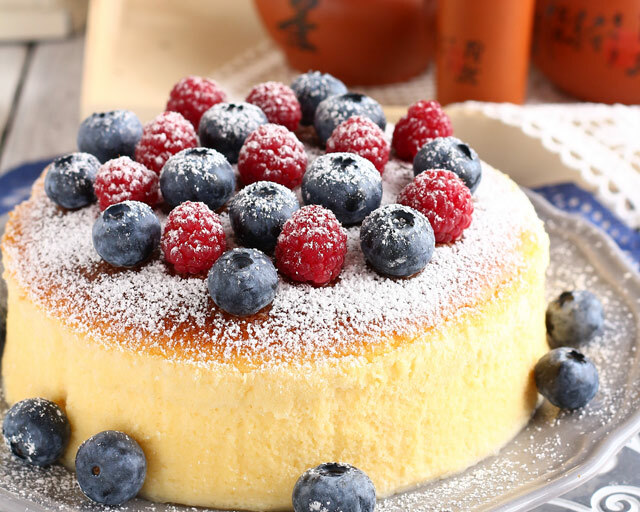 I find your recipe interesting since you are using all-purpose flour for the japanese cheesecake instead of cake flour like most of the other recipes have. 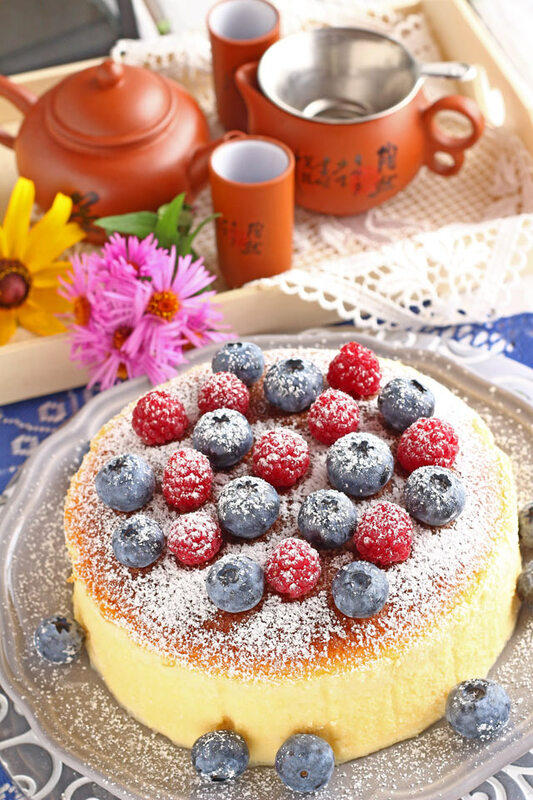 Now I feel relieved that I do not have to buy cake flour in making a japanese cheesecake. ???? Though I feel hesistant when it comes to that ‘folding’ part of the batter. 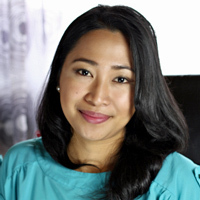 Hi Ana, I do have a youtube channel but sad to admit it is not updated for the last 2 months now because of the time constraint with all the prep and actual move from Germany to the Philippines. But hopefully, soon we will upload new videos, including the Japanese Cheesecake! ???? Link to our channel is https://www.youtube.com/c/FoxyFolksyM1005. The cake rose but then had cracks on the side and then eventually flopped to about half the height (about 3 in.). Texture is nice–very light and airy and it’s not too sweet. I just need to work on the aesthetics of the cake. Hi Michelle, Yup, sometimes you have to get to know your oven a bit better to know how it works. Also, it could be that the egg whites are over beaten. For some reason. My cake is like dougy??? Not cook on the buttom..
Hi Janice, could it be it has something to do with the oven you are using? Are you using top and bottom heat and not only from top? I am also a bit confused when you say it is doughy since it was never a dough to start with. It is more like an airy batter for a cake. The texture when baked should be like a very light cheesecake and is very moist. So, I would say, try checking your oven if the heat is distributed evenly (top and bottom). Maybe you should also see if the temperature is correct. Hope that helps. ???? It looks amazing! So pretty and a different technique to the ones I’m used to. I’d be quite happy to make this three times to get it looking right though as I am a complete cheesecake addict as far as eating them goes. Definitely going to make your Japanese Cheese Cake. 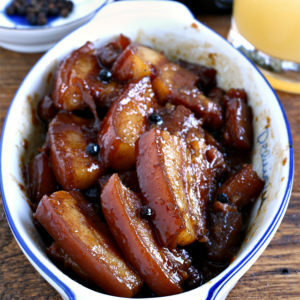 Looks so delicious Bebs! Hi Prashant, it is delicious as it look! Enjoy ???? Hi is there a substitute for cornstarch in this Japanese cheesecake recipe? I haven’t tried substituting the cornstarch in this recipe myself, but maybe you can try to use cake flour instead of all-purpose flour and omit the cornstarch. Ok thank you I will try that! I followed this recipe to the TV and it was still liquidy after baking. Should the oven have been preheated to 350 then lowered to 200 once we put it in the water pan? Hi Heather… I only preheated the oven with the pan with water for water bath at 150°C not 350°. Then increased to 200°C when the pan with batter is placed inside the water bath. Also check that the pan where you put your batter is completely sealed or else the water might seep in. Perform the toothpick test before turning off your oven, if it does not come out clean yet then bake a bit longer until it does. What is normally the low and medium speed when you beat the eggs on the hand or stand mixer? Hi Theresa, I usually use my stand mixer (with 7 level speed) to make meringue because I find the elec. hand mixer beats too fast. I start at level 2 then gradually adding speed with level 5 as the highest until it forms soft peaks. Do you actually melt the cream cheese and butter, or just warm it?